hese are items currently available for sale from Necrotales. Shipping is included within the United States for any items on this page, including insurance for the full value. Items will be sent day after payment, Monday through Fridays, in a sturdy box surrounded on all sides by foam rubber and mounted in place (if necessary). International shipments may require additional shipping costs. This is determined on a case-by-case basis, depending on weight, destination, and method of shipment. For reassurance, please review my eBay reputation. If you are interested in any of the pieces available on this page, please contact me. Additional photos are available on request. Please note that any items for sale here do not include any associated trophies or other awards. All prices are listed in US dollars. 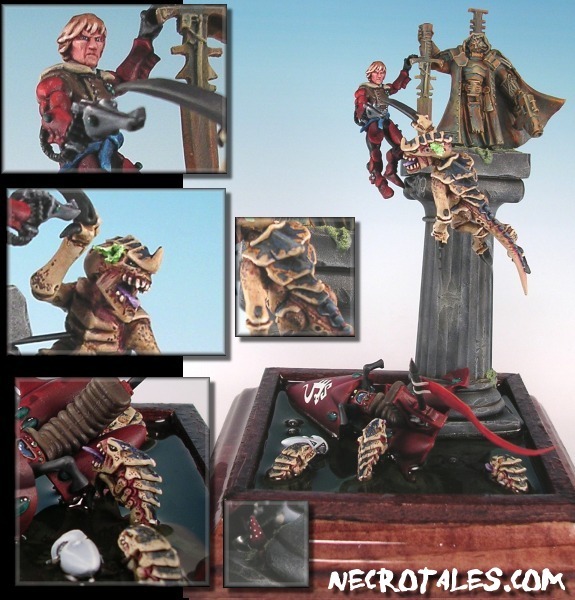 Diorama which won first place at Gamesday Baltimore 2005 in the "Best Duel" category, it features an unlucky Eldar jetbike pilot, an even unluckier hormagaunt, and three hungry rippers. Extensive conversion work done all around. Want to see a larger image? From the Chainmail line, precursor to the current plastic line by WotC. Usable in D&D Skirmish or D&D games, with felt on base. I still feel this is some of the best non-metallic metal I've done!